It happens many times, you are almost ready to leave the home and suddenly remember that the phone battery is very low. I don't know why this happen to me when I need my phone the most. Although Android is one of the most popular and even most loved operating system for mobile platform but there is no doubt in fact that Android battery drain very fast. This is the problem with every user. Right? Generally speaking, it's not the Android fault. There are number of factors which affect battery life. In my previous article, I had already discussed some of the essential tips which can help you to save your phone's battery life. For example, you can turn off all useless things like Wi-Fi, mobile data, NFC, GPS, Bluetooth and Hotspot. 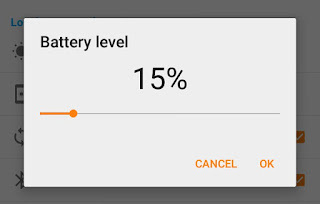 Apart from this, there is in-built feature in Sony Xperia phones named as "Low-Battery mode", which let you save battery life when it is below certain minimum limit. Here I will explain you everything about this feature. Let's start from basics. What does Low-Battery mode actually do? Low-Battery mode will simply disable all power-consuming features and settings when your battery power is below certain minimum limit. For example, your phone will automatically turn off mobile data, auto-sync, vibration, GPS, Bluetooth, Wi-Fi and Hotspot like features when this low-battery is activated. This also allow you to set screen brightness and screen timeout (or sleep time) manually. Note that, you'll still receive phone calls and text messages. This feature can be helpful when your phone battery is too low and you're in remote area where you can't charge your mobile. 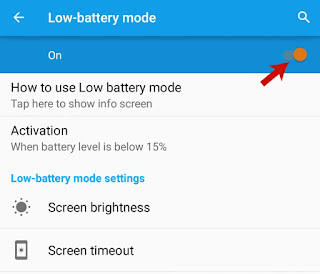 How to turn on Low-Battery mode? Now click "Power management" option. Alternatively, you can click the battery icon from your notifications tab. Under power saving modes, click "Low-Battery mode" option. To turn it on, simply switch on the button at the top-right corner of the screen. To change the minimum threshold limit when you want to activate this mode, click the "Activate" option. Now a pop up box will appear. Move the slider to set battery level below which you want to activate this feature automatically. I recommend it using between 15-20%. 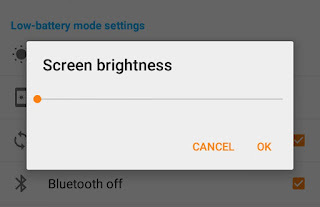 To change the screen brightness, tap the "Screen brightness" option and then move the slider to set it. Note that, if you want to save more battery life, make sure to keep screen brightness very low. Next comes screen timeout. 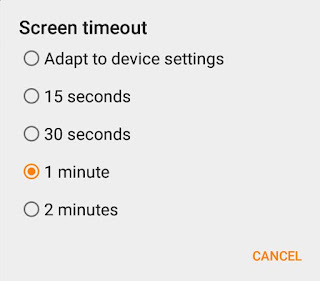 This allow you to set the time after which your phone will be locked and screen will go black. Simply tap this option and select time. 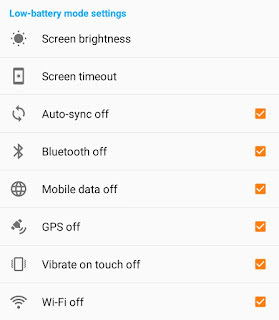 Adapt to device settings option will keep your screen timeout same as it was in default settings. Finally tick mark the button next to each wireless and connectivity features such as GPS, Bluetooth, Wi-Fi, Hotspot, mobile data and NFC. Now whenever your phone will be in low-battery mode, it will automatically turn off these features to save battery life. Unfortunately, this low-battery mode is available in Sony devices only. But there is a good news for all Android users. 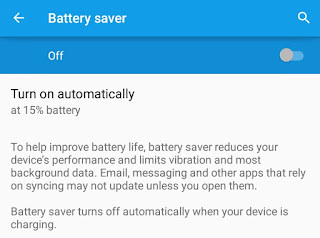 Android has added a new feature in 5.0 and later versions, named as "Battery Saver Mode" which let you save battery life by reducing phone's performance and limiting vibration and most of the background data. Email, messaging and other apps that rely on syncing may not work unless you open them manually. To enable this feature, simply go to "Settings > Battery". Here click on menu button (three dots at the top-right corner of the screen) and tap "Battery saver" option. Now switch on the button. If you want to turn it on automatically, tap the “Turn on automatically” option and then select minimum battery percent limit from the drop-down menu. Some other manufacturers also provide their own battery saver modes. For example, Samsung offers an "Ultra Power Saving Mode" and HTC offers an “EXTREME Power Saving Mode". Their only aim is to reduce device's performance and limit background data. 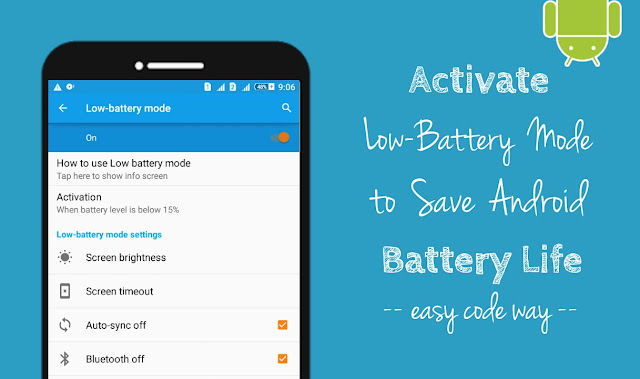 This is all what you need to know about Android battery saver modes. If you've any questions, please drop them in below comment box. Stay tuned for more interesting tutorials. Did I had missed something?